Enter the Pennzoil Spin to Win Sweepstakes! If you do not have a code click “I don’t have a code” to get your free game code. Ends 06-15-2018. Good Luck! The last day to request a code to spin is May 31, 2018. I won an Amazon Echo and my husband won a $20 Shell GC. If you do not have a code, there is a limit of one (1) code per person, household or address, without a Purchase. Prizes are available while supplies last. The last day to Spin to Win is June 15, 2018. Participants, at their option and discretion, may elect to “opt-in” to receive future marketing and promotional communications from Sponsor. Failing to “opt-out” or “opt-in” or later “opting out” will not affect Participants’ chances of winning a specific Prize. 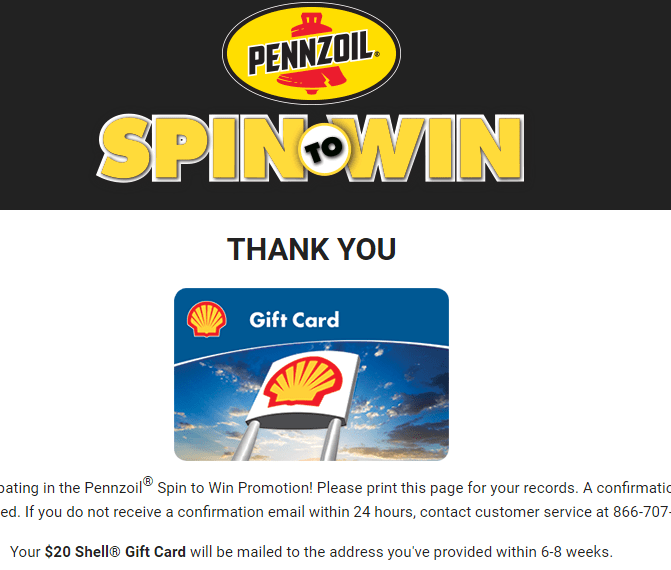 The Pennzoil Spin to win sweepstakes offer began at 12:01 AM CT on April 1, 2018 and ends at 11:59 PM CT on May 31, 2018 (“Promotion Period”). Offer valid at participating locations only. For a list of participating locations, click here. Void in RI or where prohibited or restricted by law. Valid while supplies last and is subject to promotional availability. No substitution or cash redemption. Limit one (1) text link and/or prize per person, household or address during the promotion period. Texting is not required to participate in this Offer. Consumers may also participate by visiting www.Pennzoil.com/spintowin. Reward cannot be combined with any other offers or discounts. Must be eighteen (18) years of age or older to redeem. Prizes are not transferable or refundable. Last day to request a text link to Spin is 11:59 PM CT on June 7, 2018. Text links expire at 11:59 PM CT on June 15, 2018. Promotion valid only in the United States (excludes U.S. territories or possessions). Std. Msg. & data rates may apply. If the URL is obtained via text message, you will receive 1 text message in response from an automated system, unless you have opted in to receive future marketing and promotional materials from Sponsor. Text STOP to end texts. SOPUS Products may amend, modify or discontinue this promotional offer at any time without notice. 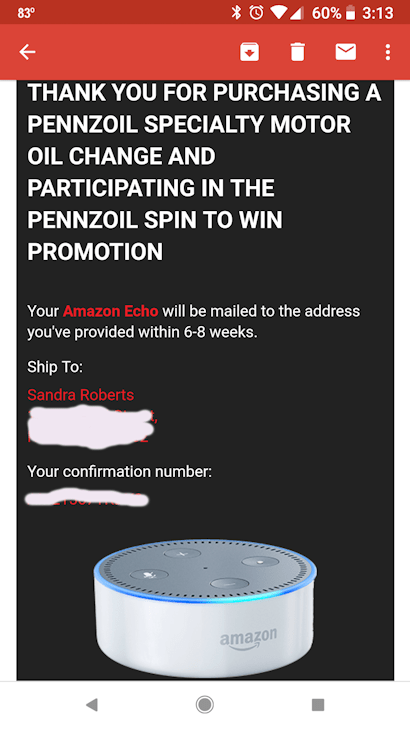 For details on how to participate without making a purchase and to see full Terms and Conditions, please visit Pennzoil.com/spintowin for complete details.